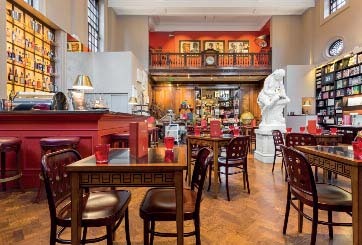 By kind permission of Maison Assouline, The Lutyens Trust welcomes you to the former Midland Bank by Sir Edwin Lutyens. Join us for one or both lectures for this autumn lecture series. Please note that the venue for the first lecture on 29th October has been changed, and it will now take place in the Library at The Bloomsbury Hotel 16-22 Great Russell St, London WC1B 3NN. Apologies for any inconvenience caused. Tickets are lecture specific. Please make sure that you purchase the correct ticket for the lecture you wish to attend. Thank you. Lectures are in association with The Young Georgians – part of The Georgian Group. Edwin Lutyens’s building of 1922 has now been turned into Maison Assouline, the smart bookshop of Assouline, the French art books publisher. While there has been some alteration to the original panelling on the ground floor, upstairs the spaces, in a neo-Wren style, are quite complete, and include the former bank boardroom with panelling, plasterwork and a chimneypiece. Open Monday to Saturday from 10am to 8pm, the shop provides a wonderful opportunity to see a Lutyens interior in central London. The work of Edwin Lutyens has received much scholarly study since the 1980s, but various significant commissions he received from clients in Spain are still but little known. Unfortunately, Lutyens was unable to complete these commissions, largely because of the deterioration of Spain’s economy and social order in the 1930s. Then, and related to this, the ensuing Civil War obliterated most of the evidence about them in Spanish archives. Both of these tragic factors have played major roles in keeping these projects in the dark. Most of Lutyens’s projects in Spain (the first project for El Guadalperal, La Ventosilla and House for Cimera) coincided with World War I. For Lutyens, as with other architects, this was a time of much-reduced activity and forms an interval between two extraordinarily prolific phases in his career. His work at Delhi had slowed down and was finally suspended during 1917–19 when commissions at home also ground to a halt. The Spanish commissions formed the mainstay of his works during the war years, and offer, together with a few other works which he developed during these years, a valuable insight into his evolution as an architect at this time. This is important to understand his work, for, as we will see, these were crucial years in his career as an architect. They were years of a quiet interlude between two peaks in Lutyens’ career, namely the early 1910s and the post Great-War years. 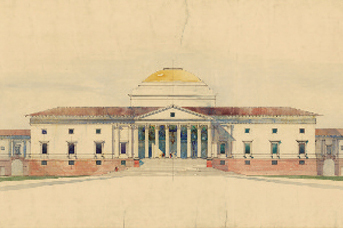 Between the years in which Lutyens had designed the Viceroy´s House in Delhi, Ednaston Manor and Castle Drogo and those of the Cenotaph, the Great War Memorials and his confident corporate buildings in London spanned a period of virtual unemployment in which works at home and in India were at an almost complete halt due to the war effort. Lutyens’s projects in Spain allow a fuller understanding of his work as they cast light on an obscure but crucial period of his career which was, however, a time of rich and fruitful formal experimentation. Finally, These little-known projects are also an evidence of the intense cultural exchange between Britain and Spain that took place during the first decades of the twentieth-century, after centuries in which both countries regarded each other as military and cultural enemies. In fact, Lutyens designed the palaces of El Guadalperal and La Ventosilla not in an international classical style, but in a getting inspiration from Spanish Renaissance architecture. The use of this style by an English architect, which was virtually unprecedented, shows a growing awareness of Spanish architectural heritage by British scholars and architects. This process reached a peak in the first decades of the twentieth-century, when these projects were commissioned. Secondly, that Lutyens received these important commissions from Spanish clients is evidence of the growing cultural influence that Britain exerted on Spanish elites in the early twentieth-century. Iñigo Basarrate graduated as an architect (University of Navarra, 2012) and gained an MA on Architectural History and Theory (University of Navarra, 2013). He later undertook a doctoral research at the University of Edinburgh focusing on Edwin Lutyens and his works in Spain, fully funded by the university (Edinburgh College of Arts scholarship 2013-2016) and by the Spanish Government (Beca Hispanex 2016). He has presented parts of his research at academic conferences, lectured at the University of the Basque Country and published part of his doctoral research in academic journals (Architectural History and The British Art Journal). 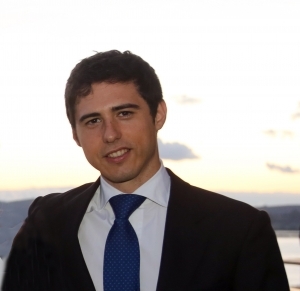 Iñigo works as an architect in Bilbao while he continues researching on architectural history and preparing publications. His research interest include the work of Edwin Lutyens, late classical architecture, English architecture in Spain and the British reception of Spanish architecture. If you wish to pay with a cheque, please use the online booking facility above, and then choose the “pay by cheque” option on the payments screen. This will reserve you a ticket(s) and give you instructions on where to send your cheque to. All cheques should be made payable to “The Lutyens Trust” and made to the sum of £15. This lecture was first given in February 2013 when I was Master of the Worshipful Company of Chartered Architects. It is unusual for The Master to present this lecture, but it is a subject that turned out to be ideal as it is still remembered as a highlight event. I consider how Sir Edwin Lutyens (1869-1944), who was born in Onslow Square, Westminster, and lived in London at three addresses, finally in Mansfield Street, responded to London in his work, not only in the metropolis. EL is probably best-remembered for his many country houses (with gardens by Gertrude Jekyll), New Delhi and The Cenotaph. Although born In London, he spent much of his adolescence in Surrey, briefly served articles under Sir Ernest George, and set up practice at the age of twenty. His affection and knowledge of the buildings in the City, particularly the Wren Churches and St Paul’s Cathedral was reflected in his buildings far and wide, including the British School in Rome, where he was required to reproduce the upper west front of St Paul’s. His major commercial buildings of the ‘twenties and ’thirties included Britannic House, Finsbury Circus; the former Midland Bank HQ in Poultry (now restored as ‘The Ned’), the Piccadilly branch (now Maison Assouline); and the former Reuters building in Fleet Street feature progressive classical roof silhouettes, corners which open up as the building rises and games with rustication including the notorious ‘disappearing pilasters’. 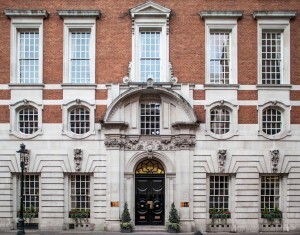 The former Crane HQ at 120 Pall Mall featured the ‘Delhi’ order with its temple bell adorned capitals. The Mercantile Marine Memorial on Tower Hill is one of ELs finest classical war memorials. As President of the Royal Academy, near the end of his life, Lutyens led a team of architects and produced a reconstruction plan for London, distilled from his core conviction of a sense of place reconstituted in classical form. The axial view across the Thames to the south transept of St. Paul’s, now connected by the millennium bridge may well have been inspired by the RA plan. After his death on New Year’s Day 1944, Sir Edwin Lutyens was laid to rest in the crypt of St Paul’s Cathedral. This lecture will examine Lutyens’s work in the City of London in the context of the continuum of his remarkably prolific oeuvre, and the fluctuating critical response over the past 75 years. Mervyn Miller is an architect, town planner and historian, with degrees from the Universities of Durham and Illinois. His Garden City research began 40 years ago, when Principal Conservation Officer for North Herts DC and soon embraced the projects designed by Edwin Lutyens in the district. He was appointed a Director of Hampstead Garden Suburb Trust in 1979. His 1981 his PhD from Birmingham University ‘The influence of Sir Raymond Unwin on the evolution of British town Planning’ included the origins of HGS. In 1985 he became a founding trustee of The Lutyens Trust, and served as Architectural Adviser until 2011. An independent consultant since 1988, he has specialised on heritage matters, and on the diaspora of the Garden City concept, presented at planning history conferences worldwide, including New Delhi, where he has assisted the LTs endeavours to protect New Delhi as a World Heritage Site. 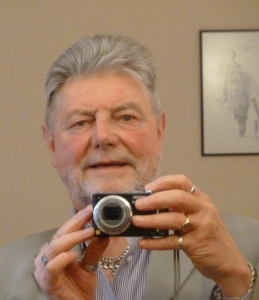 Author of the histories of Letchworth GC and Hampstead GS; Life President of Letchworth Garden City Society and of Hampstead Garden Suburb Trust, in 2014 appointed Parker Scholar by Letchworth Garden City Heritage Foundation. Visiting Fellow at the University of Hertfordshire he was awarded a Fellowship of the RIBA in 2017. The History of Architecture and Planning remains his fulfilling intellectual passion.